Shovels, dirt, farm animals, cement, sand, and manure were the props of the memorable Grade 9 Explore Nepal trip. Add dedication, teamwork, empowerment, grit, and camaraderie, and 19 grade 9 students had the perfect recipe for the ultimate rewarding experience. The Tharu community near Chitwan National Park saw first-hand the enthusiasm, motivation, and dedication that this group of Lincoln students exuded during their latest Explore Nepal trip. Our Explore Nepal program was a beautiful meld of environmental stewardship, community involvement, cultural awareness, and student empowerment. During the day, students were engaged in building different stages of biogas facilities. By building this alternative energy resource, families can cut their cost of LPG gas canisters by an average of 80%. The result is a more sustainable energy source that converts animal and human waste to a gas that can be used to light a household cooking stove. Our students were able to make an authentic, practical, and lasting contribution to a local community. In addition learning about environmentally sound and sustainable energy production, the students were immersed in the culture of village life. 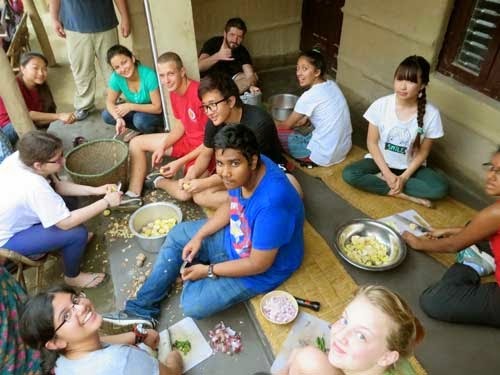 The students cooked, fished, and danced with our welcoming and gracious hosts, widening their perspective of life in Nepal and experiencing different cultural practices. Additionally, the group bonded with plunges into the river water after a hard day’s work and silly card games, along with the warmth of a fire every night reflecting on their time spent in the Tharu community.